May do the night before but must store ingredients separately. 1. Cut mozzarella into 1/8 inch slices and store covered in refrigerator. 2. Cut tomato slices 1/8 inch think and store covered in refrigerator. 3. Take some of basil leaves and roll on top of each other into tube shape and slice thinly across to turn into shreds as seen in photograph. RECOMMEND DOING THIS AT LAST MINUTE SO THEY LOOK FRESH. 4. Reserve two leaves of basil for each tomato rose. 5. Cut stem out of top of tomato. 6. Beginning at top of tomato start slicing just beneath the skin of tomato in a spiral pattern all around and down the entire length of tomato. when reaching the end you will need to make the last part of the spiral be a round part that will be the entire bottom of the tomato. This will serve as the base of the rose so that it can stand. NOTE : the sliced spiral will need to be supported as you go to avoid breakage. If it does break, no worries. You can piece together. But try not to let it break. 7. With the bottom part of the tomato first, start gently twirling spiral around and on top of it to form rose. Set gently on plate and place one fresh basil leave on each side. 8. If doing individual plates you will need more roses. 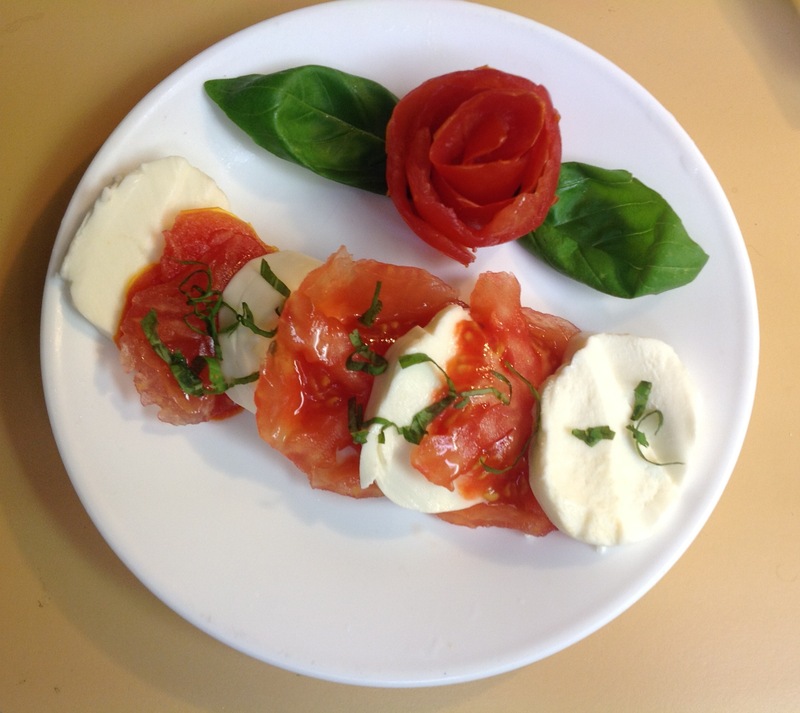 If doing a platter make three roses and place in center of platter and spread alternating slices of tomato and mozzarella around the roses in a circle. Cut and sprinkle fresh basil across the top and drizzle with olive oil if desired. May thinly drizzle Italian salad dressing on top of tomatoes and mozzarella in a single motion.